The Swiss ski resort of Davos is about to become a refuge for politicians and executives seeking respite from a 2019 that’s mere weeks old and already proving turbulent - China slowing, Brexit unravelling, the US government shuttering. For those seeking the familiar, this week’s annual World Economic Forum (WEF) will feature the usual itinerary of glittering Champagne receptions and marquee-name panelists. Yet the organisation is also looking for some upheaval this year. It’s recruited six young leaders, all millennials, as co-chairs to join Microsoft CEO Satya Nadella in shaping the discussion. The age of the co-chairs notwithstanding, the overall demography of the event still skews older. The average is 54 for men and 49 for women. This Davos also marks the third year in a row that a majority of WEF co-chairs are women, a clear diversity commitment but one that hasn’t quite moved the needle for the event as a whole. The overall share of female attendees remains less than one in four. Young or old, women or men, Davos attendees are all worried about extreme weather events. It’s the third year that such concerns topped the WEF’s annual global risk survey, followed by the related challenges of failed climate change mitigation and natural catastrophes. Technological risks are also keeping business and world leaders up at night, namely cyber attacks and data fraud or theft. Climate change is particularly on the minds of some of the new leaders (and leaders in waiting) attending Davos this year. New Zealand Prime Minister Jacinda Ardern will discuss safeguarding the planet with TV naturalist David Attenborough and former US Vice President Al Gore on Tuesday. Less of a fan of the topic: Newly elected Brazilian President Jair Bolsonaro, who had a hand in canceling plans for his country to host the 2019 United Nations Conference on climate change. Due to the US government shutdown, climate-change skeptic President Donald Trump isn’t attending this year and also pulled the government delegation. However, he’ll still be there in spirit, given the likely chatter about his ongoing trade disputes with China and other countries. After all, the title of this year’s WEF is Globalisation 4.0. Some 700 attendees at the event, nearly a quarter of the total, are from major trade partners with which the US has trade deficits - which Trump often obsesses over. Still, even with the government representatives dropping out, the American contingent remains the biggest by far. As the WEF annual meeting’s headcount has grown over the years to around 3 000, so has its money-making potential. In the last fiscal year, revenue amounted to 327 million Swiss francs ($337m), up 15% from a year earlier. That’s primarily thanks to payments from partnerships: They account for almost 70% of revenue and have more than doubled in the last five years. 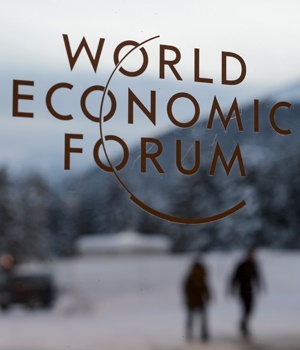 While such sums fall well short of what’s needed to solve the world’s climate crises, they suggest the WEF (and the Davos annual meeting) can comfortably ride out whatever geopolitical and economic upheaval the coming year has in store.